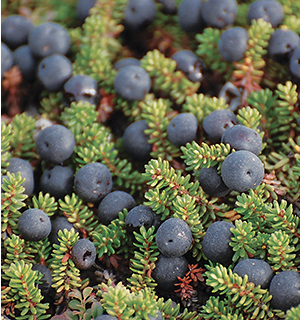 Nunavik’s flora varies with the region’s biomes, from taiga to tundra. Southerly cities like Kuujjuaraapik, Kuujjuaq and Kangiqsualujjuaq are located on the edge of the treeline. Here we find black spruce, tamarack and various species of shrubs. To the north lies the tundra, its vegetation composed almost entirely of lichens. Despite the apparent scarcity of plant life, there is a wide variety of flowers and small edible fruits that can be harvested in the fall. 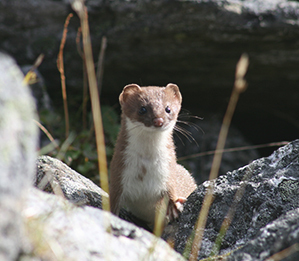 The region is rich with wildlife. Traditional food is key to the Inuit economy and lifestyle, with walruses, beluga whales, seals and fish, such as the Arctic char, playing an important role. Muskox was successfully introduced in the 1960s. The harsh seasonal variations, from short summer to cold winter, force Nunavik’s animals to adapt to nature, creating one of the most impressive migrations in the animal kingdom. For centuries, towering stone statues of human forms have marked the treeless horizon. We call these stone men “Inukshuk.” They are symbols of Inuit culture, timeless messengers offering directions or marking good hunting and fishing grounds. When the Inuit lived in semi-permanent camps, they were used for storing meat out of reach of animals. Nunavik was inhabited for more than four millennia by Paleo- Eskimo peoples, who crossed the Bering Strait from Asia. 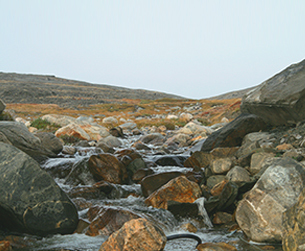 At the turn of the first millennium AD, the first Thule sites appeared in Nunavik. The Thule — the ancestors of the modern Inuit — came from the northwest of Canada. The establishment of European trading posts in the eighteenth century brought about drastic and irreversible change. The Inuit remained nomadic before moving towards a settled life only two generations ago. In 1975, the Inuit signed the James Bay and Northern Quebec Agreement. This treaty provides a legal framework for relations between indigenous groups and the two levels of government. It also led to the creation of several administrative entities, real governmental structures that have allowed the Inuit to establish their own priorities in key areas of community development. These entities are the Kativik Regional Government, the Kativik School Board and the Nunavik Regional Board of Health and Social Services. Nunavik is located north of the 55th parallel. This glaciercarved region of tundra, lakes and boreal forest covers 60% of Quebec’s landmass. Nunavik is home to the highest mountain in Quebec (Mt D’Iberville in the Torngat Mountains), the northernmost town in Quebec (Ivujivik) and one of the highest tides in the world (up to 17 metres). The climate and seasons vary. The summer season is mild (12 ˚C on average) and the sun almost never sets. In the fall, the tundra is resplendent with colour. The winter is long and cold (-24 ˚C on average), but much drier. Yet from late March to late June, spring sets off a great natural rebirth. 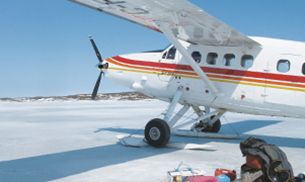 There is no road to Nunavik from the south: travellers arrive by air (First Air or Air Inuit). All communities have an airstrip. This country of wide open spaces and breathtaking beauty has just over 12,000 inhabitants. The population is divided into 14 villages, spread evenly between Ungava Bay and Hudson Bay. Only four communities have more than 1,000 residents, including the regional capital of Kuujjuaq, with a population of 2,375. As their hunter-gatherer society was subjected to massive and rapid change, the Inuit gradually settled. The population is experiencing sustained growth, consisting mainly of young people — 60% of Inuit are under 25, double the corresponding figure in southern Quebec. The sheer size of the region means that they are widely dispersed. Educational attainment and employability are steadily increasing. The Inuit are an ancient people, known for their rich culture and warm hospitality. Although their modern lifestyle is more diverse, they are still closely linked to hunting and fishing. A strong environmental consciousness means that the Inuit still live in harmony with nature. The aircraft is the primary means of transport throughout the year. 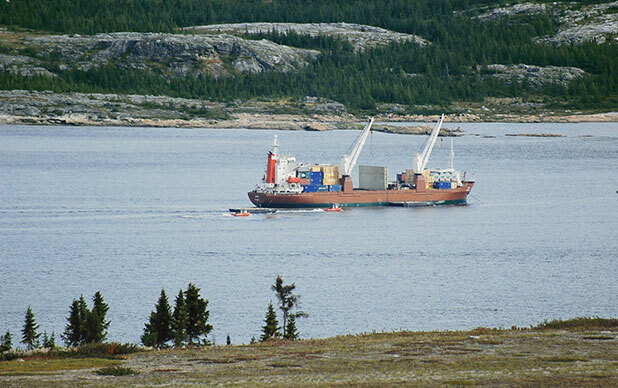 However, boats can also be used to supply goods during the shipping season. Even in small communities, automobiles and utility vehicles are increasingly common. 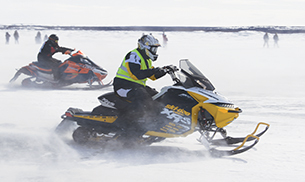 Despite this, almost every family relies on a snowmobile to get around. In summer, power boats and all-terrain vehicles are commonly used. 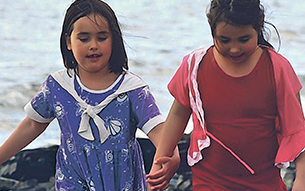 Inuktitut is the language used for children until their second year of primary school. French and English are introduced bit by bit from Grade 1 to Grade 3. After this point, students can choose to receive instruction in English or French, although many learn both. Like Nunavik Regional Board of Health and Social Services and health centre staff, the CLSC employees in each community are housed in modern, comfortable, self-catering apartments away from the workplace. Satellites have increased the spread of telecommunications, benefitting all communities in Nunavik. Satellite TV and Internet are available in every village. The postal service is present across the region and major newspapers are available in some places. in the north, life is so much more than work. in addition to a new job, you will have to adapt to a new climate and a different way of life. it is important to take time to understand and respect the inuit culture, to get involved and to always have an open mind. The discovery of a new culture and intensity of social relations offsets the small size of local populations. Mutual support and the development of good relationships are the best ways to integrate into everyday life and work. All of the communities share similarities. Services vary based on population: general store, community centre, gym, childcare centre, school, CLSC, police, roads and garbage collection. A typical sight on the roads are the municipal trucks that supply drinking water and collect wastewater. Hydro-Québec supplies electricity using oil generators. A wide range of outdoor recreation activities are available year round. In addition to world-renowned traditional activities like hunting and fishing, there is hiking, snowshoeing, cross-country skiing, mountain biking and snowmobiling. 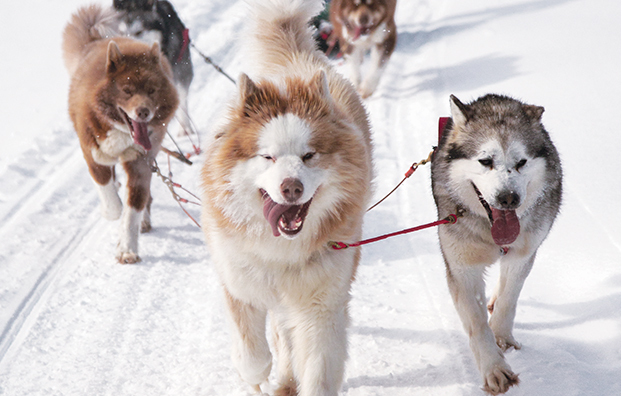 Lively celebrations mark the seasons, such as berry picking festivals, sled dog and snowmobile races and the amazing Puvirnituq Snow Festival. 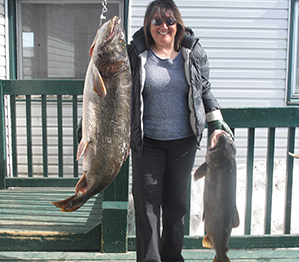 Attractions: Parc national Kuururjuaq, Mt D’Iberville (1646 m), Alluviaq Fjord, George River, Helen’s Falls, excellent fishing and wildlife watching. Attractions: Capital of Nunavik, administrative and commercial centre, old military base, Atlantic salmon fishing, caribou hunting. Attractions: World record tides, the world’s largest herd of hoofed animals (caribou), internationally renowned Arctic char fishing. Attractions: First village in the Canadian Arctic planned entirely by the Inuit, marine mammal watching, near the caribou migration route, very hospitable and friendly people. Attractions: Akpatok Island, walrus and polar bear watching, Arnaud River, huge tides, mussel harvesting, 11th century Viking archaeological sites. Attractions: Diana Island is home to a muskox herd, numerous archaeological sites, excellent hunting and wildlife watching sites. Attractions: Parc national des Pingualuit, Douglas Harbour (spectacular fjord), Qikirtaaluk Island and Qajartalik archaeological sites. Attractions: Deception Bay: a beautiful area renowned for its hunting and fishing; Sugluk Inlet: its natural beauty will leave you speechless. Attractions: Cape Wolstenholme: abandoned Hudson’s Bay Company trading post, one of the world’s largest colonies of thick-billed murres, polar bear watching on Mansel Island. Attractions: Smith Island: thousands of Canada geese, observation of geese during spring migration. 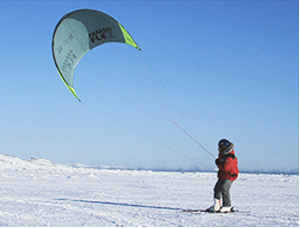 Attractions: Puvirnituq Snow Festival: a celebration of Inuit traditions held every two years, snow and ice sculpture contests, Tamusi Qumak collection, archaeological sites. Attractions: Richmond Gulf: surrounded by the highest cuestas in Quebec (over 365 m); Clearwater Lake: the second largest natural lake in Quebec; Seal Lake: home to a population of freshwater seals. Attractions: Manitounuk Islands: incredible cuestas and abundant wildlife, Amitapanuch Falls.